You’ve finally snagged your coveted Upper East Side apartment for rent, now, what are you going to do with it? No doubt it looks fabulous as is, especially if you’ve set up shop in a place as lovely as Renoir House. There are a few improvements you can make, however, that require little in the way of effort and will go a long way in making your space that much more appealing. Specifically, we’re talking about setting up a fabulous indoor garden. It’s a simple enough task that even a raw beginner can accomplish a suitable DIY solution, and there’s a wealth of information out there to get you started down the right path. Which is exactly what we’re bringing to you today. Read on, because we’re about to explore how you can nail that indoor garden on your first try, and provide a few ideas to help you experiment with various permutations of your indoor paradise once you become more experienced. If nothing else, trying your hand at a bit of gardening will bring some joy into your life. That’s more than enough reason to give it a shot, and there are just a few steps you’ll have to complete to make it a reality. It’s obvious that your plants can’t just grow anywhere in your apartment space, and since you’re indoors, you can’t just set up some pots on the patio and call it a day. You’ll need to think strategically. 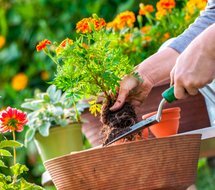 You’ll have to dedicate a space in your home that gets plenty of sunlight (near a window, naturally), and set your plants up in a way that makes optimal use of your available space. There are plenty of ways to go about it, but one of the best collection of indoor planting arrangements we’ve seen comes by way of Apartment Therapy and their guide: 15 Indoor Garden Ideas for Wannabe Gardeners in Small Spaces. Among the many varieties of planting ideas, you’ll see a common theme — maximizing vertical space. Whether you bolt your plants to the wall, use a rolling planter with multiple levels, or set up a pallet or wire structure from which to hang your pots, the idea is to get as many plants in as possible without clogging up a bunch of floor space. Once you’ve identified the look that appeals to you most, grab your materials, assemble your planting arrangement, and proceed to our next step. This step is almost as easy as finding some seeds, planting them, and caring for them as they grow. We need to stress the word “almost,” though, because you still need to select what plants will work for your indoor space. The Snake Plant: a waxy, sharp-leafed plant that absorbs carbon dioxide during the day and releases oxygen at night — the opposite of many other plant species. The Aloe Vera Plant: the instantly-recognizable succulent whose gel is used as medicine for cuts, burns, rashes, and abrasions. The Spider Plant: a common houseplant whose leaves can be cut, re-planted, and grown into new Spider Plants. The English Ivy: known for improving air quality by filtering benzene and formaldehyde from the air (a must have if you know any smokers). The Chinese Evergreen: which thrives even in low light conditions and requires very little attention to remain healthy. Make a list of what you’d like to grow. Team up with a neighbor. Don’t start your seeds to early. You may have to soak, scratch, or chill seeds before planting. In general, you should try to get familiar with the types of plants you want to grow, which means doing some research about what kind of soil they like, how much water/sunlight they need, etc. With just a bit of knowledge, you can create a beautiful indoor garden that will be the envy of all your friends and neighbors. Not that it wasn’t attractive before, mind you. Places like Renoir House are hailed for their inimitable beauty. Take one look at some of the amazing interiors and you’ll likely see why. Spacious studios, one bedrooms, and two-bedroom apartments with interiors that are designed in a manner quite unlike anything you’ve seen before. It’s the perfect recipe for luxury living, right here on the beautiful Upper East Side of Manhattan.